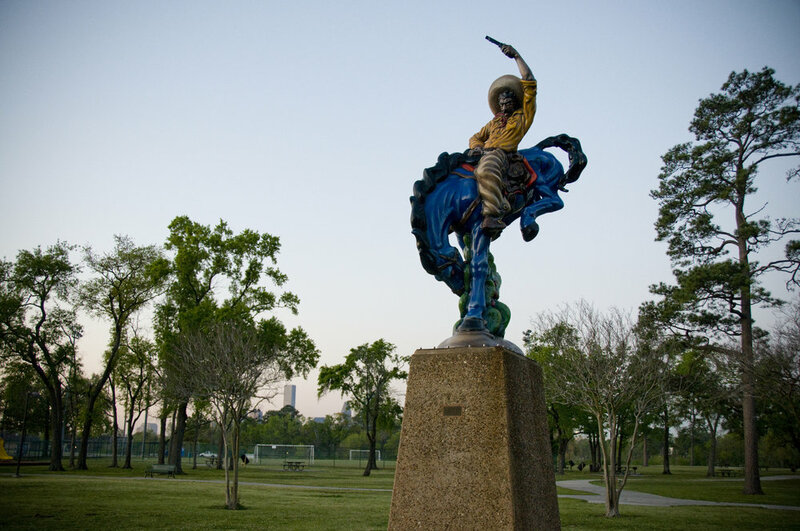 Allen Parkway is a navigational asset connecting River Oaks to Downtown, running parallel with Memorial Drive, and feeding into the Washington Corridor all the way to the Heights. There is also much to be seen in the area! Visit the historic home of Ima Hogg at MFAH’s Bayou Bend, or the ever-inspired Art Car Museum. The thriving Washington Arts District is full of art and design galleries, studios, venues and community centers making it the perfect place for a weekend adventure. Taking a flight out of Hobby Airport? I recommend first stopping by El Bolillo Bakery in Gulfgate and grab a pan dulce before (or after) your flight. Still hungry? Drive fifteen minutes and journey back 30 to 40 years at Tel-Wink Grill. This classic diner serves American comfort food off Telephone Road. Personal note: The last time I flew out of IAH Airport, I arrived early to my flight. To pass the time, I decided to walk around the airport and take photos of every artwork I came across. To my surprise, the Houston Airport Art Collection (part of the City of Houston Art Collection) is so large that I had to stop, turn around and board my flight! I advise you to look around the next time you are at IAH or Hobby Airport and take in the bounty of paintings, sculptures and craft objects. Art can make all the difference while traveling, and it says a lot about a city’s character. Open your eyes to it! For the Northside neighborhood, I consulted resident Jimmy Castillo, from What’s on Jimmy’s Plate?, for insider recommendations. He suggested that “if you want really good tacos, walkable from the park, it's gonna be Taconazo Veracruzano, a taco truck at a tire shop just two blocks north of the park on Fulton at Irene. They only do three kinds of tacos; fajita, barbacoa and trompo – and all are the best. And get the frijoles. Be prepared to order in Spanish. On a hot day, it’s nice to grab a raspa or licuado at the Tampico Refresqueria on Irvington." Finish the day on the Rice campus and catch the dreamy sunset sequence of Twilight Epiphany. Meditate here and become a part of artist James Turrell’s world of light and perception. 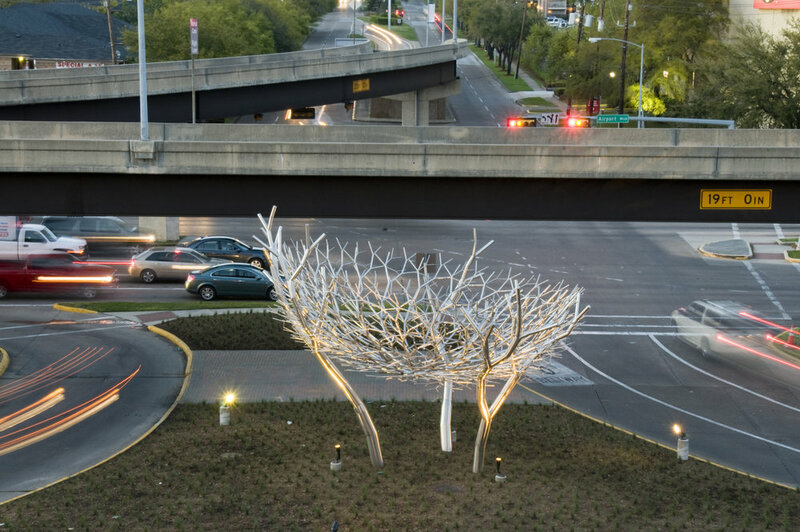 Scroll through the Rice Public Art's website to learn more about the collection and program. There are PLENTY of places to eat, drink and explore in Houston's East End. Moontower Inn is a go-to casual drink spot with great beer, charming movie nights and delicious hot dogs. Check out Voodoo Queen for cocktails and grab a bite at Dona Maria (where the tortillas are made fresh by hand just like abuelita would). After work at Blaffer Art Museum, I would naturally be in an inspired mood and want to explore the surrounding neighborhoods. While in the Third Ward, stop by Project Row Houses for a look at how the organization is animating its community. And a must stop is Green Seed Vegan for tasty healthy raw + vegan food, juices and smoothies. Get the cauliflower nuggets! Discovery Green may possess an extensive events and activities calendar, but nothing to me beats taking photos in front of these iconic pieces. Grab your camera, take selfies and then eat lunch nearby at the new Texas-sized Jackson Street BBQ or the home-style Vietnamese spot Huynh. Of course the art listed above is all on view, but there is still so much more to explore. This is just the tip of the iceberg and our challenge to you is to get to know your city! We will be sharing more of the lesser known pieces soon.